Do Codification and Systematization Sound Boring? Too Bad — If You’re Running a School, You Need Them. Think about your school’s morning arrival procedure. Maybe your school starts the year with a combination of a “kiss and learn” drop-off lane, a volunteer crossing guard, and a number of teachers and leaders who welcome students into the building and offer caring touchpoints. There is also a team of people ensuring breakfast is ready and in the proper location. But maybe this doesn’t work out as planned. The procedure doesn’t work well in the rain, or when the time changes and it’s still dark outside. Or maybe it doesn’t work well because students need more time, or because parents stick around in the morning to talk with teachers and leaders. So your school teams test, pilot, and refine this procedure, and maybe they even do so more than once. But what happens the following school year when the person who led the effort is on parental leave and the school welcomes new team members? Far too often, these kinds of procedures — and the important lessons learned — don’t get written down and saved in an easy, logical place. This forces new staff to recreate the wheel and causes frustration and burn-out from returning team members. It means the team is losing valuable time thinking about problems that were solved in the past instead of building upon new opportunities to support student learning. Are the decisions or processes well-aligned with the school’s mission, vision, goals, and approach? If you are a school that strives to be mentally healthy, does your morning arrival procedure offer students and adults touchpoints with the school community to feel safe and loved? If your school is a Montessori school, does it allow for young children to make the decision to start their day while also remaining safe and providing sufficient logistic supports for parents and transportation providers? Are the decisions or processes well-aligned with the growing network’s philosophy (i.e., how “tight or loose” the network is managed)? For example, will every school’s arrival look the same or will it vary campus by campus? Who makes the ultimate decision on arrival practices: the operations manager, the principal, a family representative, or the executive director? If you’ve made it with me this far, I’m sure there is some skepticism. 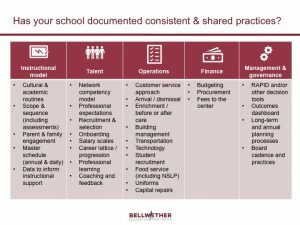 Codification and systematization may sound bureaucratic to some — a great way to become exactly what your school wanted to stay away from. I also know that writing things down can feel daunting (just ask my colleagues how long it took me to write this blog post!). But consider the benefits as well. Codification ultimately saves time because it helps people move faster with each subsequent repetition. Imagine a single-site school that serves 400 students. Let’s also imagine this school has 25 teachers with an 85% retention rate (5% move on to leadership roles and there is 10% attrition each year). This school is hiring approximately four teachers a year. The principal leads the hiring efforts: screens resumes — mostly referrals from his/her robust network, schedules lengthy interview calls to test for fit, and invites strong candidates to do a demonstration lesson for students. What happens when there is a second campus and a leader who does not have selection experience? That leader doesn’t have five years of practice in thinking about which interview questions were predictive of success and which were not. That new leader also likely has a million other things to think about! Writing down a hiring practice that is well-aligned to the school model helps this new leader get up to speed faster. It also helps the network should they decide that hiring will happen centrally, because a recruitment process that is written down can be reviewed, refined, and implemented by leaders at different campuses. Codifying shared practices will ultimately help the school’s unique learners: the new leader can now focus on students and not have to worry about creating or re-recreating the wheel. Codification and systematization are practices that help teams get further faster. Stay tuned for our next #SGInstitute blog post, where we’ll continue to discuss teams and talent. This entry was posted in School Leadership, Strategic Planning, Talent and tagged #SGInstitute on January 24, 2019 by Katie Rouse.